At around 5 a.m. on December 12, 2017, FBI agents, supported by officers from the Dallas field division of the ATF and the Dallas Police Department, broke through the front door of Christopher Daniels’ apartment on Belt Line Road, near Addison. The officers ransacked the place and dragged Daniels and his 15-year-old adopted son from the apartment in their underwear. For half an hour, the two stood in bare feet and handcuffs, in 30-degree darkness, before Daniels was placed in the back of a squad car. When he arrived at a holding cell at the Earle Cabell Federal Building in downtown Dallas, he learned he had been charged with illegal possession of a firearm. But the FBI appeared to have been looking for something more. The agents had confiscated from Daniels’ apartment a Taurus Protector Poly .38 special, a Norinco AK-style assault rifle, and bags of ammunition. They also took notebooks in which Daniels had scribbled doodles of AK-47s and copied out quotes from African-American writers like Robert F. Williams, the author of Negroes With Guns. Daniels had been on the FBI’s radar for more than two years. During that time, they watched the 34-year-old as he participated in open-carry demonstrations in South Dallas with an organization he co-founded called the Huey P. Newton Gun Club. 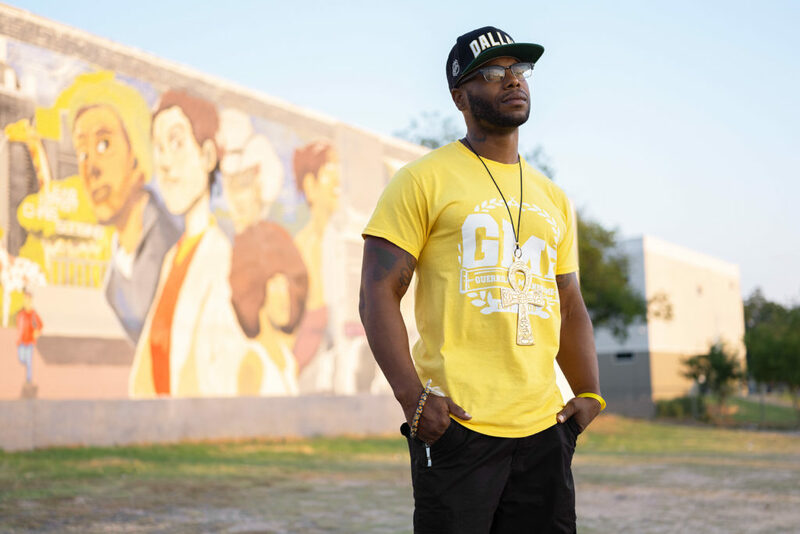 As a leader in another group called Guerrilla Mainframe, Daniels trained young men in martial arts and self-defense in a run-down Oak Cliff apartment complex. The FBI was watching then, too. In an affidavit submitted to the U.S. Northern District Court of Texas, FBI special agent Aaron Keighley, who specializes in domestic terrorism, claimed that Daniels’ social media activity indicated he “openly and publicly advocates violence against law enforcement.” At his bond hearing, a federal magistrate judge ruled that Daniels represented such a serious threat to society that he should not be released on bail. After Daniels’ arrest, outlets like Foreign Policy, New York, Al-Jazeera, and many others picked up the story. The Guardian portrayed him as a social justice warrior. While Daniels sat in federal prison in Seagoville, something unexpected happened. A few months before his arrest, an internal FBI memo had surfaced that described a new program designed to keep tabs on a domestic terrorism threat the law enforcement agency labeled “black identity extremism.” When the program became public, national and international media outlets picked up Daniels’ story. This political activist had been charged with illegal firearm possession, but he was being held because of comments he’d made on Facebook. Was he the first person being prosecuted for “black identity extremism”? Daniels sat in prison for six months, as he lost his IT job; and his family, without support, was forced to move to other parts of the country. The federal government never filed additional charges against him. His court-appointed defense attorney successfully argued that the firearm charge should be dismissed because it hinged on a prior misdemeanor conviction of domestic assault in Tennessee—a case that did not necessarily involve a violent crime. On May 1, 2018, U.S. District Judge Sidney Fitzwater set Daniels free. As Daniels set about trying to put his life back together, questions loomed over him. Was he a threat to society, a ticking time bomb that federal agents had failed to keep locked up? Or was he actually a victim, a target of the sort of 1960s-era surveillance programs designed to infiltrate, discredit, and disrupt Martin Luther King Jr.’s organization and those of other civil rights activists? Before I ever heard of Christopher Daniels, I was familiar with some of the groups he belonged to. In the wake of the Michael Brown killing in Ferguson, Missouri, in 2014, the Huey P. Newton Gun Club began to get attention from national and international news outlets. Vice sent a reporter to Dallas to investigate the atypical second-amendment advocates who were staging open-carry marches through the streets of South Dallas. The marches were often covered on local TV news, too. After Daniels’ arrest, outlets like Foreign Policy, New York magazine, Al-Jazeera, and many others picked up the story. The British newspaper the Guardian portrayed Daniels as a social justice warrior; the Wall Street Journal called him a kook; and the Dallas Morning News article about Daniels’ release framed him as someone prone to violence who got off on a technicality. It seemed like the closer you got to Dallas, the less likely you were going to see Daniels portrayed as a victim of the latest attack on civil rights. Then there was the way Daniels and his associates in the loosely affiliated groups they created—the Huey P. Newton Gun Club, Guerrilla Mainframe, and Geronimo Tactical—presented themselves on social media. While Guerrilla Mainframe’s promo reel documents food and clothing drives the group runs in southern Dallas, the organization’s YouTube channel is a mix of videos from weekend martial arts and CrossFit training classes, Facebook Live reviews of various firearms, and Daniels orating into his phone camera while waiting at a bus stop. Depending on which video you click on, Daniels comes across as a gym rat, or a gear head, or a political gadfly. But a danger to society? I found that notion hard to buy. A few months after his release from prison, I arranged to meet him at Cafe Brazil in Deep Ellum. Daniels arrives with Robert Taylor, another member of Guerrilla Mainframe, and Stephen Benavides, who co-founded Dallas Communities Organizing for Change. Daniels is stocky and wears bluejeans and a gray t-shirt. He has short, black hair and a thick, black beard, and I can make out the outline of a tattoo of the state of Texas on his bulging left bicep. After we sit down, the first few minutes of our conversation revolve not around guns, politics, or police brutality, but his diet. Since his release from prison, he has been pushing himself to go from vegetarian to vegan, with the goal of becoming a raw food vegan. He orders the vegan tacos. Daniels doesn’t come across as a kook or even a militant. As we talk about what put him in the international spotlight—guns, radical left-wing political views—he frames everything in terms of self-improvement. He teaches teenagers living in impoverished corners of the city martial arts and self-defense, he says, because he wants them to have enough confidence and pride to not join gangs. He runs weapons training classes at a ranch in East Texas because he wants to promote gun safety and teach African-Americans how to properly use their weapons. That family-first mentality was drilled into him at home. His parents met in college. His father works as a logistical operations router in the oil and gas industry, and after working a string of administrative jobs, his mother eventually began working in IT. In 1988, four years after Daniels was born, the family moved into a quiet neighborhood near the corner of Kiest and Westmoreland. Daniels attended a private elementary school run by the Full Gospel Holy Temple, and his parents kept him busy with additional home schooling and music and art camps. His father read a lot—autobiographies of jazz musicians, the Bible, encyclopedias, theological works by evangelical writers like Chuck Swindoll and Charles Stanley—and he made his son read, too, and then tested his comprehension. A pianist and percussionist, Daniels’ father taught his son to play drums. Both parents had a facility with computers, and it rubbed off on their only child. Dressed up and down: Members of Guerrilla Mainframe, including Robert Taylor (second from left); Charles Goodson, aka Yafeuh Balogun (third); Christopher Daniels, aka Rakem Balogun (fifth); and Erick Green, aka Erick Khafre (eighth). Friends say Daniels was a quiet but active kid. When he could get away from extracurriculars and home studies, life revolved around football and basketball. Games were competitive. That sometimes made it difficult for Daniels’ best friend, Erick Green, who was born with a handicap and uses prosthetic legs to walk. Green and Daniels have known each other since they were infants, and Green’s mom used to watch Daniels when his mom had to work. Sometimes that loyalty landed Daniels in trouble. When a friend got into a fight during middle school, Daniels jumped into the fray and put the other kid in the hospital. The school pressed charges, and Daniels was arrested. He was arrested again in high school when a friend was shoplifting at a mall and Daniels, unwilling to turn in his friend, says he was charged as an accomplice. At Kimball High School, in Oak Cliff, Daniels played percussion in the stage and marching bands. He ran track and cross-country, and wrestled. A sophomore computer class revealed an aptitude for coding, and he built the wrestling team’s website. Wrestling was Daniels’ life in high school, and the sport also provided a lens through which he began to see the disparities between his world and the world outside his neighborhood. As college loomed, Daniels wasn’t sure what he wanted to do with his life. Listening to stories of family members who’d served in the military, though, got him thinking. Daniels enlisted in the Marine Corps in June 2001. Three months later, the World Trade Center towers fell. By 2003, he was in Ramadi, Iraq, serving in an artillery unit. For a young man who wanted to be a warrior for his country, Daniels seemed to be at the right place at the right time. But the Marines was very different from the world he knew back home in Oak Cliff. At Kimball High School, Daniels played percussion in the marching band. A computer class revealed an aptitude for coding, and he built the wrestling team’s website. Daniels felt increasingly alienated. It seemed unfair to him that U.S. soldiers and poor people in Iraq shouldered all the pain and suffering of a war that never accomplished its goal of finding weapons of mass destruction. Daniels never showed much interest in politics, but in the military, he started to read books like Michael Moore’s Stupid White Men and Dr. Claud Anderson’s Black Labor, White Wealth. After serving three and a half years of an eight-year commitment, he requested early leave. He left the Marines with an Other Than Honorable discharge and a new sense of purpose. “I wanted to be able to be a warrior for my community,” he says. Daniels landed in Memphis and moved in with his girlfriend at the time, a lawyer he’d met in the Marines. For a while, he got into mixed martial arts, but he also volunteered for faith-based organizations like Memphis Inner-City Outreach and eventually landed a job as a caseworker with a group called Juvenile Intervention and Faith-Based Follow-Up. He served as a liaison between kids released from juvenile detention and their parents, teachers, and the courts. They took the kids to volunteer for Habitat for Humanity and brought them to Memphis Grizzlies games. But life in Memphis was something of a shock for Daniels. Daniels’ personal life in Memphis was also troubled. Money was tight. When the power company turned off his electricity, he tampered with the lines and turned the power back on himself. The power company found out, and he was arrested. During an argument with his girlfriend, she began smashing his belongings in their house. Daniels grabbed her around the arms to restrain her. The cops were called, and Daniels was arrested for domestic assault. After that, he entered another tumultuous relationship that produced a son in 2007. He would ultimately win full custody, but life as a single dad in an adopted city was difficult, and he began plans to move back to Dallas. In 2008, while Daniels was still in Memphis, his buddy Green was living in an apartment complex in Pleasant Grove. It wasn’t ideal. At least three drug dealers operated out of the complex. Shootings and robberies were commonplace. A friend of Green’s, Charles Goodson, was studying to be a paralegal at El Centro College, and he came across a Texas statute that allows citizens to openly carry firearms. The two hatched a plan. After clearing it with the apartment complex management, Green and Goodson improvised a security force by inviting over six friends who owned guns. All they did was hang out with their weapons in front of the drug dealers’ apartment. “Imagine seeing eight people with guns,” Goodson says with a grin. “We didn’t have to be confrontational.” Customers stopped showing up, and the drug dealers eventually moved out. The group continued patrolling the apartments and started calling themselves the Guerrilla Mainframe, a name partially inspired, Goodson says, by reading about Ho Chi Minh’s Viet Cong guerrilla resistance forces in the book People’s War, People’s Army. In addition to the patrols, they organized community outreach—staging health clinics and screening people for HIV, organizing food drives and distributing free groceries. They taught classes about healthy living, vegetarianism, and political activism. Many of Guerrilla Mainframe’s ideas and actions—self-defense, self-policing, direct action, and community-provided social services—were inspired by the work of the original Black Panther Party. Goodson had gone to grade school with the daughters of Fahim Minkah and, through his cousin, knew Marvin Crenshaw, two of the original members of the Dallas chapter of the Black Panthers. They helped introduce him to writers like Robert F. Williams and Black Panther Party co-founder Huey P. Newton. Made in Dallas: Daniels, aka Rakem, lost his apartment, his car, and his family while he was sitting in prison. When Daniels returned to Dallas from Memphis, he joined his friends’ organization and connected with another group called Dallas Communities Organizing for Change. Unlike in Memphis, where community groups were primarily faith-based, in Dallas there was a tightknit group of activists who were inspired by people like Malcolm X and Marcus Garvey. It was the first time Daniels encountered writers who spoke directly to an understanding of black identity that acknowledged the experience of being partially defined by slavery or colonization, of being inheritors of a history that has long been dismissed or deleted from the dominant historical narrative. And that’s exactly what Daniels has done. He adopted a new name: Rakem Balogun. Ra is taken from the name of an ancient Egyptian sun god. Kem is short for Kemet, the name for ancient Egypt, which is derived from the Egyptian hieroglyphic that means “black” and is believed to refer to the rich and fertile black soil of the Nile delta. Balogun, a last name that he shares with Charles Goodson (whom Daniels now calls his brother and who goes by Yafeuh Balogun), means “warlord” in the Nigerian dialect of Yoruba. Even as Rakem was undergoing his political and intellectual transformation, his activism had to take a back seat to family life. He worked for an insurance company, investigating healthcare fraud, before moving into IT. Then, in February 2012, Trayvon Martin was shot and killed in Florida. A few months later, 31-year-old James Harper was shot by a Dallas police officer in the South Dallas neighborhood of Dixon Circle. For southern Dallas residents, the story of Harper’s death was horrifyingly familiar. Weeks earlier, police had shot and killed 21-year-old John Husband during a traffic stop. In October 2010, police killed 25-year-old Tobias Mackey, unarmed, at his Oak Cliff apartment complex. There were countless other stories, burned into neighborhood memory, passed down from parents to children like gruesome fairy tales. According to a 2014 report by Dallas Communities Organizing for Change, Dallas police killed 58 people between 2002 and 2013. After Harper’s death, Dixon Circle residents took to the streets. For a feverish moment, it looked like South Dallas was about to erupt into the kind of violence that would engulf Ferguson, Missouri, two years later. But cooler heads prevailed. And then, less than a year later, it happened again. Clinton Allen was shot by a Dallas police officer in March 2013. The police shootings enraged Rakem, and in 2014, he and Yafeuh, as well as a former associate named Darrin X, organized the Huey P. Newton Gun Club. The idea was simple. If they armed themselves and protected their own communities, then police wouldn’t need to be called as often, and less police presence would lead to fewer police shootings. Of course, people openly carrying guns does tend to draw a police presence. And media attention. In August 2014, the group staged its first open-carry march on Martin Luther King Jr. Boulevard. Donning military fatigues, wearing caps, and carrying assault-style rifles, they marched through the streets in formation, chanting “black power.” It almost looked like cosplay: a Che Guevara-inspired paramilitary unit steeped in rhetoric that hearkened back to the black revolutionary militancy of the 1960s. The presence of the young black men armed and marching down the streets of Dallas landed the group on local news—which was the point. The Huey P. Newton Gun Club wasn’t just a stunt. Rakem and Yafeuh wanted to raise awareness of police violence, and they wanted to raise awareness within the African-American community that they had a right to bear arms. 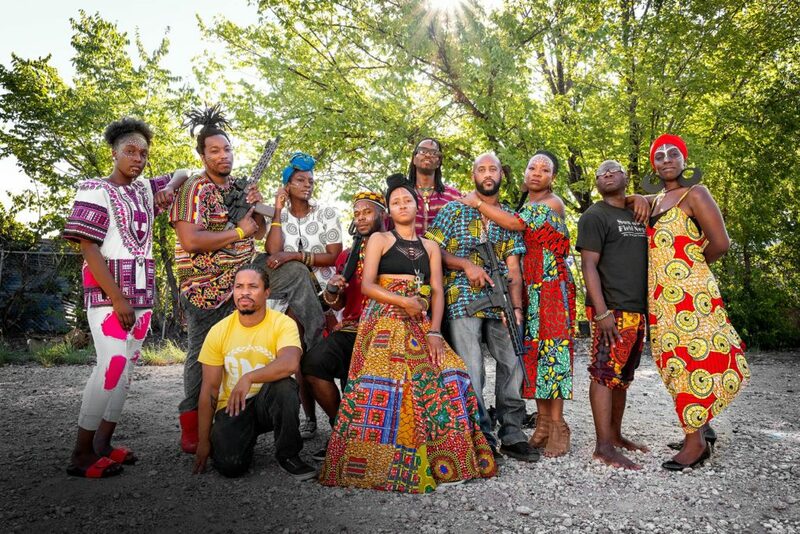 Symbolically, the group’s militaristic motif self-consciously engaged with racial double standards implicit in issues of gun control and freedom of expression. Some of the United States’ earliest gun control measures were passed to keep firearms out of the hands of African-Americans. Armed marches by the Black Panther Party in the 1970s prompted California Gov. Ronald Reagan to draft gun control legislation. Even in the circles around Martin Luther King Jr., who professed nonviolence, guns were kept handy as tools of self-defense. Not everyone in the community bought the Huey P. Newton Gun Club’s tactics. Akwete Tyehimba, owner of Pan-African Connection, a bookstore and community space in South Oak Cliff, has known Yafeuh and Green (who now calls himself Erick Khafre) since they were teenagers. She lets them host meetings at her store but tells them to leave the guns at home. The presence of the young black men armed and marching down the streets of Dallas landed the group on local news—which was the point. Rhetoric aside, the Huey P. Newton Gun Club wasn’t all that different from Guerrilla Mainframe. But when Guerrilla Mainframe was running health clinics or handing out food, the media never turned up. Now that they were running military-style training camps at the apartment complexes on weekends, the cameras and reporters followed—and so did the police. Unmarked Dallas police cars typically followed gun club marches. On its way to an open-carry march in Austin in 2015, a caravan of Huey P. Newton Gun Club members was pulled over on Interstate 35 by Waco police who searched their cars for 45 minutes before letting them go. A video of the group chanting, “Oink, oink, bang, bang,” and, “The only good pig is a pig that’s dead,” in front of the state Capitol landed them on Alex Jones’ Infowars. That’s where FBI special agent Aaron Keighley first learned about the club. Soon after, the FBI began its surveillance. As the FBI kept close tabs on Rakem and the Huey P. Newton Gun Club—monitoring their weekly CrossFit-style workout sessions, and watching them go to gun ranges, stage health clinics, teach self-defense classes, patrol drug-riddled apartment complexes, and preach socialism, vegetarianism, yoga, and healthy living to poor Dallas communities—another young man who was not on the federal agency’s radar planned his own response to the wave of police shootings. On July 7, 2016, during a rally and march in downtown Dallas, Micah Johnson packed weapons into a duffel bag, drove to a corner of Main Street, near El Centro College, and shot and killed five police officers. If micah johnson believed he was operating in the interests of the anti-police brutality movement, everything he did that summer night inflicted unfathomable damage, not only to the lives of the officers he killed and their families but also to the movement he erroneously believed he supported. After the shootings, activists felt muzzled. President Barack Obama came to Dallas for the funerals of the fallen officers and lauded Dallas Police Chief David Brown as a champion of police reform. The department that had been under fire over the past few years for its high rates of police killings became the face of the Blue Lives Matter response to the Black Lives Matter movement. No group came under as much scrutiny as the Huey P. Newton Gun Club. Media outlets reported that Johnson was a member of the gun club because he’d liked the group’s Facebook page, but Rakem says Johnson was not a member and he had only met him in passing at community events. By July 2016, Rakem and Yafeuh were starting to distance themselves from the Huey P. Newton Gun Club. They say the club they helped found had become overly influenced by members of the black nationalist New Black Panther Party (which has no direct connection to and has been disavowed by members of the original Black Panthers). Guerrilla Mainframe’s political interests, they say, lie in promoting socialism, not black separatism. After the downtown shooting, Guerrilla Mainframe’s militant rhetoric and tactical training came across as even more inflammatory. And so did Rakem’s social media posts. Hours after the shooting, Rakem called Johnson a “hero” on Facebook, expressing his “solidarity” with the shooter and saying that the police officers “deserve what they got.” A year later, on the anniversary of the shooting, he wrote on Facebook, “Today, one year ago, one black man brought Dallas Pig Department to their knees. #77.” The comments appeared to harden the FBI’s resolve to bring down the Guerrilla Mainframe chief. Friends advised the group to tone it down, but they continued to train, posting videos on YouTube of armed, military-style operations conducted at a range near Tyler that is owned by an anonymous supporter. When the British TV news program Extreme World came to Texas and filmed one of these operations, the host provocatively suggested that Guerrilla Mainframe was training for a new race war. Rakem and Yafeuh today say they were unhappy with how they were portrayed in the show, but they laugh off the insinuation and don’t seem terribly bothered by it. Their attitude contributes to a fogginess that hangs around their ultimate intentions, the result of an apparent willingness to engage cavalierly with combustible ideas. Other activists engaged in the anti-police brutality movement praise Guerrilla Mainframe’s efforts in the community, but they have also distanced themselves from some of the group’s tactics. Dominique Alexander, whose Next Generation Action Network organized the July 7 march, says he is not a proponent of open carry, but he knows that Guerrilla Mainframe only wants to keep neighborhoods safe. Mokuria says, essentially, that her group and Guerrilla Mainframe are pursuing the liberation of black people via different routes. After the downtown shooting, Guerrilla Mainframe’s militant rhetoric came across as even more inflammatory. And so did Rakem’s social media posts. The report drew immediate criticism from civil rights organizations. The Southern Poverty Law Center said the clumsy terminology of “black identity extremists”—which lumps together a variety of groups and leaders into a fictional, unified movement—creates potential for civil rights abuses, political bias, and institutional incompetence within the FBI. Speaking with Foreign Policy, Michael German, a former FBI agent and fellow at the Brennan Center for Justice’s Liberty & National Security program, said that the new B.I.E. classification is significant because it could allow an FBI agent to justify an investigation into any racial group by claiming that any politically active individual has what is ambiguously defined as “extreme” views about their racial identity. The FBI has never confirmed that Rakem was monitored as part of the B.I.E. program. A spokesperson for the agency said they could not speak about Rakem’s case, though they issued a statement that said the FBI cannot initiate an investigation based solely on an individual’s race, ethnicity, national origin, religion, or the exercise of first amendment rights. While Rakem was in prison, the FBI never found anything in what he said or wrote on social media that could be construed as inciting violence against law enforcement. His right to make his comments about Johnson, however incendiary and upsetting they may be, is protected under the first amendment. But even if Rakem’s speech is protected, it’s difficult to imagine how he could voice support for a man who killed five people in Dallas. Around noon on a 100-degree August day, I meet Rakem in front of a factory near the corner of Cockrell Hill Road and Ledbetter Drive. As I pull up, he waits in the shade of an elm tree. He just interviewed for a position on the floor of a plastic cup manufacturing plant. It offers long hours in an un-air-conditioned warehouse with little pay. “Slave wages,” he says, as he climbs into the car. Rakem doesn’t want the job, but he has little choice. When he walked out of prison, he couldn’t return to the life he knew before his arrest. He lost his job, his apartment, his car, and many of his belongings. His adopted son, whom he took into his home after the boy’s mother died of cancer, had to move to California to live with his birth father’s family. The mother of his 1-year-old daughter, without Rakem’s support, had to move back to Houston to be near family. Friends helped him secure a one-bedroom apartment in a shabby garden apartment complex in South Oak Cliff, the kind of place that would rent to someone who had been out of work for six months because he was locked up. He is still looking for another job in IT, but in the meantime, the manager at the cup plant said to return that afternoon with steel-toe boots. Rakem said OK. The front gate of Rakem’s complex is broken, the balconies sag, and windows are adorned with aluminum foil or dangling curtain rods. As I sit on a stool in his apartment, he stands in front of etchings of Egyptian glyphs and mythical figures that hang alongside a collection of paintings, photographs, and posters that all gesture toward a common theme. A photo of 1960s political activist Angela Davis hangs next to a headshot of a young woman who runs a community garden in South Dallas; paintings Rakem’s son made to raise money for his legal defense hang next to a red, black, and green Pan-African flag that is propped up in the corner. For more than three hours, he monologizes on a smattering of topics: the injustices he observed in prison, the judicial “railroading” of black defendants, capitalism and Marxism, self-hate among African-American males, family members who are police officers, friends who were killed by police officers, black-on-black crime, times he was harassed by police officers, veganism, gangs, mentoring youth, martial arts, and Michael Jordan’s failure to give back to the community he grew up in. He strikes me as a man still experiencing the bends of political awakening, rushing too quickly to the surface of self-enlightenment, still trying to work out exactly what he thinks about the world. Finally, I ask him how he could admire someone like Johnson. Rakem tells me he has never and would never advocate violence against the police, but he sees what Johnson did as an act of self-sacrifice. Johnson knew he was going to die, Rakem says, but he did what he did anyway because he felt an urge to do something for his community. It doesn’t make sense to me. Johnson’s action harmed his community, and he harmed the movement he professed to serve—not to mention what he inflicted on the dead and their families. Johnson’s actions helped make people like Rakem—and all the other advocates working to curb police brutality—a target for law enforcement. How, then, could Rakem liken Johnson, as he did for me, to a Marine who throws himself on a grenade to save his fellow soldiers? What Rakem seems to be trying to reconcile is a conflicted moral sensibility born out of the paradoxes that are ever-present in his particular experience of the world. He is wrestling with the contradictions of a society that seems to value some lives more than others, and the ones that are valued are not the lives of his family, friends, or neighbors—not the lives of people like him. It is not the conviction of a man who expresses an extreme sense of identity but, rather, of a man who possesses a divided one. I meet Rakem and his girlfriend, Jonelle Sankara, at the Bachman DART station at 10:30 on a sunny Tuesday morning in August. Rakem has arranged to meet with FBI agents across the street at the Northeast Dallas Police Substation. At 11 am, we rendezvous with the agents in the parking lot. From the back trunk of a silver Dodge Charger, they produce a few brown boxes filled with plastic Ziploc bags containing everything from handguns to notebooks to empty bullet casings. There are also two long, flat boxes marked “evidence” that contain a hunting-style rifle and an assault weapon. Rakem takes them and shoves them into the trunk of his girlfriend’s car, which overflows with sheets, pillows, and trash. “Everything we took, we’re returning to you,” says an agent in a blue suit and wraparound Oakleys. Rakem plans to file a civil suit against the government. He also hopes to use his experience to advocate for other activists around the country who may have also been targeted or incarcerated as part of the B.I.E. program. Guerrilla Mainframe is turning its attention toward new initiatives. They want to use their training ground in East Texas for camping trips, where they teach city kids how to fish and learn wilderness survival skills. Yafeuh says he wants to move into local politics. They invite me to their next operation, which is set to take place on a Saturday in late August in southern Dallas. I arrive at a rundown apartment complex in a neighborhood called Highland Hills that is not dissimilar to the one where Rakem lives: lots of weeds, peeling paint, and bored children wandering around on hot concrete. A cluster of yellow balloons hangs outside a community center. Inside, Khafre checks visitors in at the door. In the first room, Michael Jackson’s “Black or White” blasts on a radio as two barbers give kids free back-to-school haircuts. There is a table filled with bags of free hygiene products—lotions, toothpaste—items the Guerrilla Mainframe members purchased with their own money. In a second room, a volunteer nurse tests people for diabetes. I find Rakem in a far back room, standing in front of five women seated in metal folding chairs, young children crawling all over them. He lectures about grocery shopping. “Do you ever look at the back of the can to find out how much sugar is in it?” he asks. He offers to take them grocery shopping if they need help and hands out his phone number. When he is finished, the women mosey over to a second station where Guerrilla Mainframe member Brother Marcus is demonstrating how to cook a casserole of vegetarian rice. For $15, he tells them, they could feed their family for a week. As I head back to the car, I wonder if the FBI is still monitoring all of this, still waiting for Rakem to slip up, say something he shouldn’t, do something criminal. And if they are still watching, what could they possibly make of this scene? I turn and see Rakem and Yafeuh Balogun leaving the community center. They are following a woman in her 60s who hobbles with a cane, a couple of grandkids in tow. There is nothing apparently militant about the two friends, but perhaps there is still something in their step that is deserving of a last name that means “warlord.” The Baloguns are not toting guns or wearing fatigues. They are not running the freshly groomed schoolboys through military drills or filling their heads with revolutionary rhetoric. Today that all seems like part of some distant dream, a fantasy perhaps. Today the Baloguns are armed only with crates of mangoes, which they help the older woman carry back to her apartment for safekeeping.